The Executive Secretary, National Universities Commission, Professor Abdulrasheed Abubakar and the World Bank have advised the University, to improve the funding of its World Bank Africa Centre of Excellence in Agriculture (CEADESE) project, as sponsored by the World Bank Africa Centre of Excellence (ACE). According to Professor Abubakar, the visit to FUNAAB was to perform oversight duties at the various ACEs in the country by talking to them, interacting with students and learning what they were doing. He regretted the sad experience in which the University was plunged into last year, promising that NUC would continue to support the University and play its role in regulating universities across the country, irrespective of the ministry, where a university was domiciled. He revealed that FUNAAB’s ACE would be the seventh to be visited out of the 10 centres in the country. In the CEADESE’s case, the NUC boss commended the University Management, as well as the Centre’s Director and its staff for their effort but noted that the centre could achieve more than it had before now. Based on this, he tasked the University Management to be up and doing in bringing the centre to the fore-front, to achieve its set aims and objectives. Professor Abubakar also charged the centre to close the gap between students and the members of the academic community by advising them to create more avenues in making use of the funds available to them by publishing its activities and organising conferences, in-house training of its staff by inviting resource persons to deliver talk to the affected staff. He also promised that NUC was working on the possibility of bringing all the three Universities of Agriculture (Michael Okpara University, Umudike; University of Agriculture, Makurdi (UAM) and Federal University of Agriculture, Abeokuta (FUNAAB) together on possible areas of working relationships and collaborations. On her part, the World Bank representative on the team, Mrs. Aisha Garba, expressed gladness on the improvement recorded by the centre after her earlier visit for the mid-term review. She tasked the University Management to access and utilise the fund made available by World Bank to the centre, which at the end of the project, would qualify the centre to be among the performing centres for continuous funding. 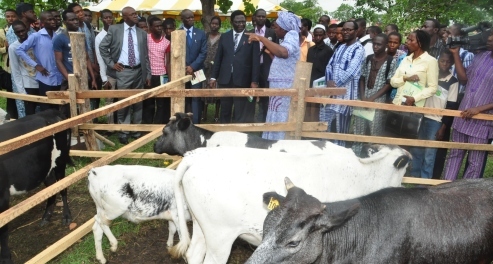 She charged the centre not to hide its activities from the people around the South-West region of the country, but to let them know about agricultural university around the region, organise conferences, training and partnering with the various stakeholders such as state ministries of agriculture, universities and other bodies. The Acting Vice-Chancellor, Professor Ololade Enikuomehin, thanked the Executive Secretary and his team for the visit to intimate the University on the areas to work on for an improvement in the ACE project in FUNAAB. He described the visit as a wake-up call and promised that the University would meet up the demands of both NUC and the World Bank in all the identified areas. On the Executive Secretary’s team were the Director, Corporate Communication, Mr. Ibrahim Yakassai, ACE Communication Officer, Mrs. Adebukola Olatunji and the World Bank representative, Mrs. Aisha Garba.